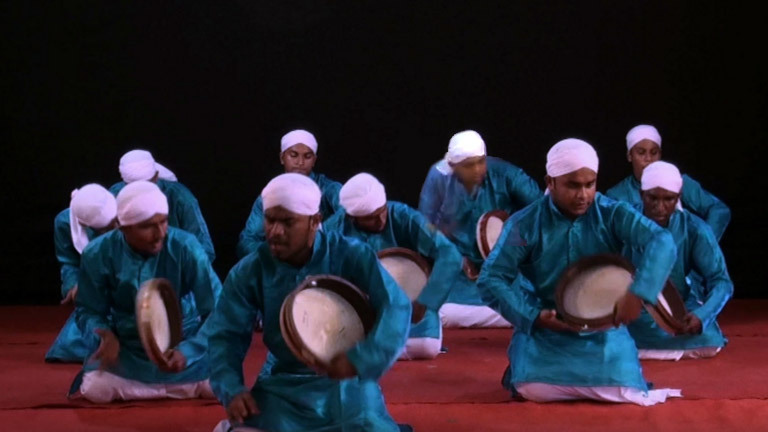 An art form with religious content, Arabanamuttu is very popular among Muslims. It derives its name from Arabana, a hand held, one sided flat tambourine or drum-like musical instrument of Arabia. Arabana muttu is performed by striking the Arabana with the hand. The instrument is made of wood and animal skin. This is performed swaying to the right and left according to the tune of the baith. The music is slow at first and gradually picks up tempo. Each part of the performance is called Adakan. The asan (leader) recites the baith. The performers follow it with their thumb, nose and shoulder; they jostle one another and make noise. This is a very lively performance. As part of Arabana, weapons are also used. Along with ritualistic practices like Ratheeb and Kuthu Ratheeb, weapons are used. In the performance of Kuthu Ratheeb sharp weapons (dabhus) are at times poked at one another. This is an art form that requires a lot of practice. Arabanamuttu is known for its expressions.